Hundreds of thousands of Venezuelans took to the streets of Caracas in marches for and against President Nicolás Maduro's government Saturday, as the nation's massive divide became ever more evident. 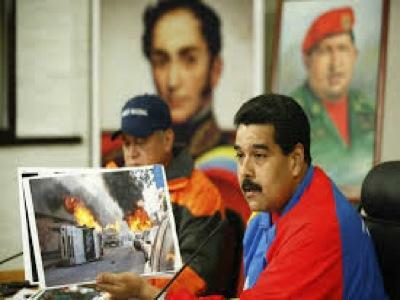 Maduro succeeded late leftist icon Hugo Chavez last year, with the country's economic problems at the heart of often violent marches that have left 10 people dead and scores injured. Maduro said remarks by US Secretary of State Kerry hours earlier on the unrest gave violent groups a "green light" to carry out attacks, slamming the top American diplomat's words as "arrogant" and "insolent." When President Nicolás Maduro of Venezuela arrived in Havana for a regional summit meeting last month, Latin American and Caribbean solidarity seemed triumphant. The United States was not invited, and in speech after speech, the region's leaders expressed confidence in a shared, unified future. Mr. Maduro emphasized that Latin America would continue on its own path of peace separate from the "imperial interests" of the United States. Mr. Maduro expelled three American diplomats from Venezuela this week, accusing them of recruiting students for violent demonstrations. He ordered three American Embassy officials to leave the country, saying they had been recruiting students to take part in violent antigovernment protests. Mr. Maduro has repeatedly accused the United States of supporting opponents who he says are plotting a coup. Chavez's election in 1998 was a huge blow to Washington and the powerful interests in the United States that wanted control over Venezuela's oil reserves – the largest on the planet.